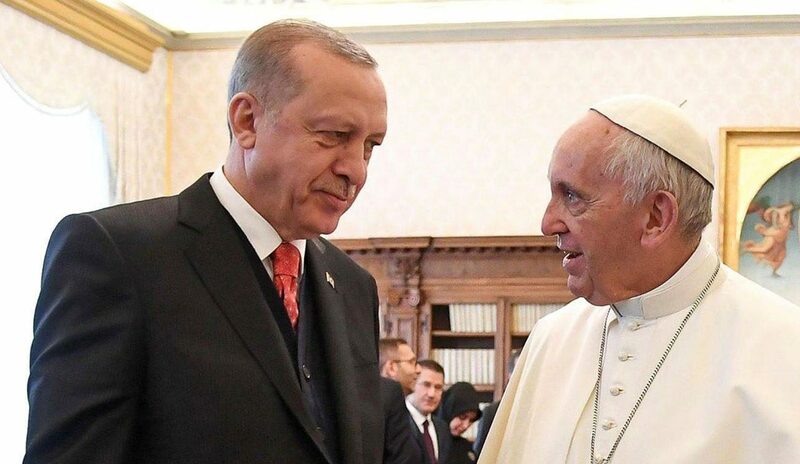 VATICAN CITY (CNS) — Pope Francis welcomed Turkish President Recep Tayyip Erdogan to the Vatican Feb. 5 for a private discussion that included the status of Jerusalem and the need to achieve peace in the Middle East through dialogue and respect for human rights. The pope also gave the president a copy of his encyclical letter, “Laudato Si'” on the care of creation, his 2018 message for the World Day of Peace and an engraving of what St. Peter’s Basilica and the square looked like in the 17th century. Erdogan had telephoned the pope in December to discuss his concern over the status of Jerusalem after U.S. President Donald Trump announced Dec. 6 that he was formally recognizing Jerusalem as Israel’s capital.